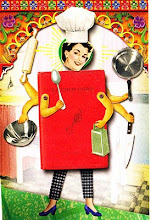 Most of the last month was devoted to Julia Child. I started off reading the special edition of Gastronomica devoted to Julia (Summer, 2005). This was my real introduction to Mrs Child and I was immediately charmed by her no-nonsense approach, her sense of humour and the wonderful relationship she had with her husband Paul. The magazine also includes some terrific photographs. I found her passion and enthusiasm and the obvious pleasure she gained from her devotion to good food both compelling and invigorating..
From there it was off to the movies to see what sort of a job Meryl Streep would do with this character. You probably don’t need to be a foodie to enjoy the film Julie and Julia but it certainly helps. I found it very satisfactory although I would have loved a bit more of Julia’s relationship with her husband and I could have taken a lot more of the gorgeous costumes. From the cinema it was a very short walk to the bookshop but I have since been pondering how many others would be inspired to go home and actually cook some of the food they had seen on the screen. Nora Ephron, the director, is justifiably proud of the way the food looked in the film and it seems many people may have come away feeling hungry but simply being interested in food and eating food are not the same thing as preparing food. Thanks principally to television, food consumers are now well educated about ingredients and terminology which makes for confident ordering in restaurants and engaging conversations about esoteric ingredients but doesn’t seem to translate to getting their hands dirty. Michael Pollan suggests that there is no longer a sense that food preparation is a ‘gratifying, even ennobling sort of work’ or that there can be any satisfaction or pleasure to be gained from something as mundane as feeding ourselves. Cooking on television tends to emphasise quick results. Pollan argues our relationship to cooking has become voyeuristic – we enjoy watching people cook because we enjoy eating food not because we want to cook the food ourselves and that our relationship to watching food preparation on television is much like our relationship to watching sport. Not surprisingly there is an inverse relationship between obesity and the amount of time spent on preparing food. Like Carlo Petrini, the champion of Slow Food as the antidote for the fast life, Michael Pollan would argue that the best food is the food you prepare yourself from fresh ingredients. Not only our own personal health but the health of our society and of the planet (think environmental degradation, soil contamination, water usage, loss of biodiversity caused by modern farming practises) could all be improved if we simply spent more time preparing food at home. But like most problems offering a solution is one thing actually making it happen is something else. Which puts me in mind of Stephanie Alexander and her Kitchen Garden Foundation. She promotes the idea of children being encouraged to learn about growing their own food but emphasises that the process is not complete until the children actually take the ingredients to the kitchen, prepare a meal and then sit down and share the food they have made. 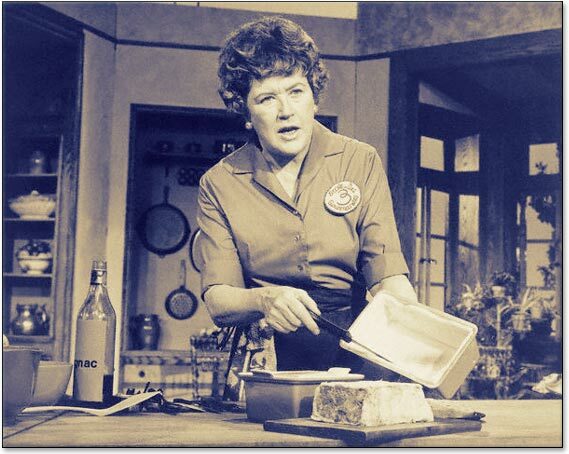 Julia Child and Mastering the Art of French Cooking may not be to everybody’s taste. Perhaps it doesn’t matter if the audience doesn’t go away and cook any of her recipes. But doesn’t the film also carry the message that there is satisfaction to be gained in challenging ourselves and following through on those challenges? Wouldn’t it be good if just a few people went home from the cinema and decided to cook just one or two more meals a week and share them with their family and friends?